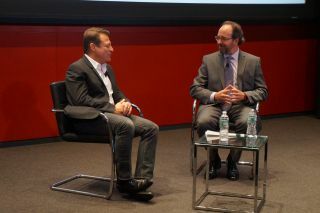 Planetary Resources' Peter Diamandis and Popular Mechanics Magazine editor-in-chief James Meigs discuss innovation during the 2013 Breakthrough Awards. NEW YORK — Space entrepreneur Peter Diamandis hopes to mine asteroids and leads the visionary X Prize Foundation to spur new technologies, but now he has a different kind of prize in hand. Popular Mechanics magazine has awarded Diamandis, the co-founder of asteroid mining company Planetary Resources, the Breakthrough Leadership Award for 2013. Past recipients of the annual award have included SpaceX CEO Elon Musk, movie director and explorer James Cameron and genomics researcher Craig Venter. With Planetary Resources, Diamandis hopes to launch a robotic mission to an asteroid in order to harvest it for its plentiful resources. Planetary Resources is also responsible for a successfully funded Kickstarter project. The campaign raised more than $1.5 million to build the Arkyd 100 spacecraft, designed to find space rocks. "The only way to open up space in my mind is through economics, to make it economically impactful for society," Diamandis told the audience here at the Breakthrough Awards in Midtown Manhattan. "It's pretty easy to do when you stop and realize that everything of value on this planet — metals, minerals, energy, real estate — are in infinite quantities in space. The Earth is a crumb in a supermarket filled with resources." Diamandis is also the CEO of X Prize, a foundation that awards money to projects that can help solve problems facing humanity. The organization just announced the Ocean Initiative, focused on innovations that will help combat issues threatening the health of the oceans. "I think the only rational reason to do an X Prize is to actually create a new economy," Diamandis said. "Lots of breakthroughs, they happen, the sit on a shelf, who cares? It's useless. It might be a good article, but unless it's actually going into business such that it is going to change the status quo, make things cheaper, faster, easier, better, more proliferated, that's the thing that matters." In 2007, X Prize announced the Google Lunar X Prize contest. The challenge asks privately funded teams to land a robot on the surface of the moon and have it travel at least 1,650 feet (500 meters). The rover needs to have the ability to send data back to Earth, and the first team that completes the challenge by the end of 2015 will receive the $20 million grand prize. Twenty-three teams are still in the running. The X Prize Foundation also helped jumpstart the commercial spaceflight industry. Officials with the organization announced the first Ansari X Prize in 1996, which promised $10 million to the first private group to send a manned spacecraft to an altitude of 62 miles (100 kilometers) twice in two weeks. In 2004, Scaled Composites won the prize with SpaceShipOne — Virgin Galactic then developed the suborbital vehicle into SpaceShipTwo, which could start taking customers on flights before the end of 2013. Read more about the Breakthrough Awards on Popular Mechanics' website.